Eave and gable-end intersections depend largely on how the eave projection is finished. Figure 93 (A through C) shows three types of commonly used intersections. Figure 94D shows an example of an aluminum soffit. Aluminum can be used for all three types of intersections shown. Where a sloped soffit is used at the eave projection, the soffit of the gable-end projection is carried through on the same plane as the eave soffit (Fig. 93B). 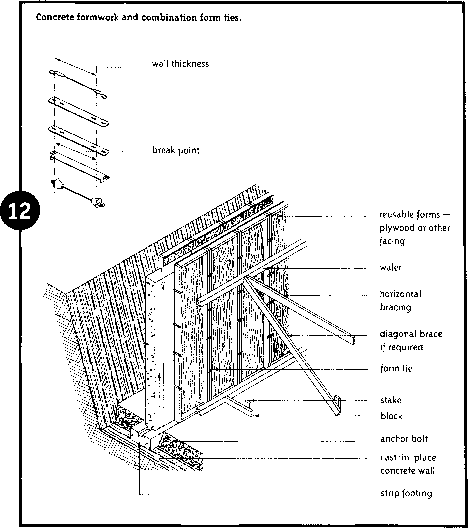 Where a horizontal soffit is used at the eave projection, the eave soffit may be carried through to the rake rafter (Fig. 93C). In this case, the soffit of the gable-end projection is terminated at the side wall and returned down to intersect the eave soffit. The fascia board at the gable end is increased in width at the eave to close in the end of the eave soffit. Another type of intersection sometimes used with a horizontal eave soffit has the eave soffit terminating at the side wall (Fig. 93A). The gable-end sheathing and siding is continued out of the edge of the eaves and serves as a covering for the end of the soffit. The gable-end soffit is carried down beyond the side wall and terminates at the eave.